Hi Marissa, The coils are considered a means of beauty, that is, they elongate the neck, so it is only the women who pursue the ‘beauty’ enhancing product (not much different to women around the world) and put up with any initial discomfort. I bet the men would agree with the terminology ‘viva la difference!’ Lol! I suppose so. It seems like a torture device to me! This is super interesting. Have seen pictures in National Geographic years ago but hadn’t read the articles. Thanks for sharing. I enjoyed learning about these women and the coils. I’ve always been fascinated by neck coils and those who wear them. They do look uncomfortable though I’m sure since this is a cultural thing, the women who wear them are adjusted to the weight. Hi Wendy, please let me know you’re new email address once you change it. Mine is smccoy@boldblindbeauty.com. Of course Steph. I’ll email you. Great post! Have you done a lot of travelling in that “neck” of the world? I responded but there may have been a hiccup and I don’t think it went through. Had a good chuckle at the pun but I’ve only been to Myanmar once before and was disappointed I did not see the Padaung women back then. I believe my mum flew with me as a babe several times to Hong Kong and India but I don’t recall any of those times. Thank you for commenting. 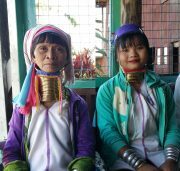 Only to Myanmar/Burma twice, but I met the Padaung women only on this trip and it was a long-hoped for wish come true. It was once unknown for them to travel out of their State or region. Thank you for commenting.